【The event is over】EMS Shipping Coupon Increased to CN￥800k! Join the Event and Win 20K Credits! The USA government decides to quit the Universal Postal Union. The China Post has to increase the shipping fee (EMS) of theparcels to the USA. Superbuy has been communicating with the China Post and asking forshipping discounts. We also delayed the price adjustment. We have been paying for the price difference after EMS increasedthe shipping fee to the USA. Superbuy will be adjusting the price of the EMS USA line on Dec 2,2018, 0:00. Check out these new savings tips! Starting from Dec 7, 2018, Superbuy will increase the total shipping coupon value from CN￥300K to CN￥800k. You can claim the coupons at 0:00 (Beijing Time) every day. Join the “Comment Event” in this post to win 20K credits. Just leave a comment in this post (pictures or text). 1. Each user can leave more than 1 comment every day. 2. Comments with only numbers, only emotes, and content that violates the rules are not eligible. 3. Only comments left under this post are eligible for the “Comment Event”. 4. You cannot leave 2 consecutive comments to claim the eligible comment. For example, if comment #50 is eligible for the prize, you cannot leave 3 consecutive comments (#48, #49, and #50) to claim comment #50. 5. You cannot leave more than 10 comments between two eligible comments. 6. You can only claim the prize once. If you win the prize more than 1 time, only the first time will count. 7. Users who violate the rules will be removed from the event. 1. Eligible Comments: Comment #50, Comment #100, Comment #150, Comment #200, Comment #250, Comment #300, Comment #400, Comment #500, Comment #600, Comment #700, Comment #800, Comment #900, Comment #1000, Comment #1500, Comment #2000, Comment #2019. 2. Corresponding Credit Prizes: 50 Credits, 100 Credits, 150 Credits, 200 Credits, 250 Credits, 300 Credits, 400 Credits, 500 Credits, 600 Credits, 700 Credits, 800 Credits, 900 Credits, 1000 Credits, 1500 Credits, 2000 Credits, 2019 Credits. 3. The user who left comment #2019 will be given the title “Comment King” and receive a CN￥88 shipping coupon (no minimum spend required). Dec 7, 2018 to Dec 31, 2018. We will send the prizes to the winners after verifying the information. We made a list of the possible questions you might have regarding the CN￥800K Million shipping coupon event. Q:Where should I go to claim the coupons? and decides to send out shipping coupons. Q: When will the event start? A: The event will start on Dec 2, 2018 (Beijing Time). Please comeand claim the coupon at 0:00 every day. Quantity is limited, don’t miss out! Q: How many coupons can each user claim per day? A: Each user can claim up to 3 coupons per day (1 of each). Q: How many types of coupons are available? Q: Are there restrictions on the coupons? and you cannot combine these coupons withother special offers. Q: When will the coupon expire? A: The coupon will expire in 1 month after being claimed. Q: Are all users eligible for this event? A:Sorry, only users who registered and verified their email addresses before Dec 2,2018, are eligible to join the event. Q:How many coupons can I apply to each parcel? A:You can only apply 1 coupon to each parcel and the coupon cannot be combinedwith other coupons. Q：What if there is a refund associatedwith the submitted parcel? A:Sorry, the deducted value from the coupon will not be refunded. Q:After I claim the coupons, where can I find them? 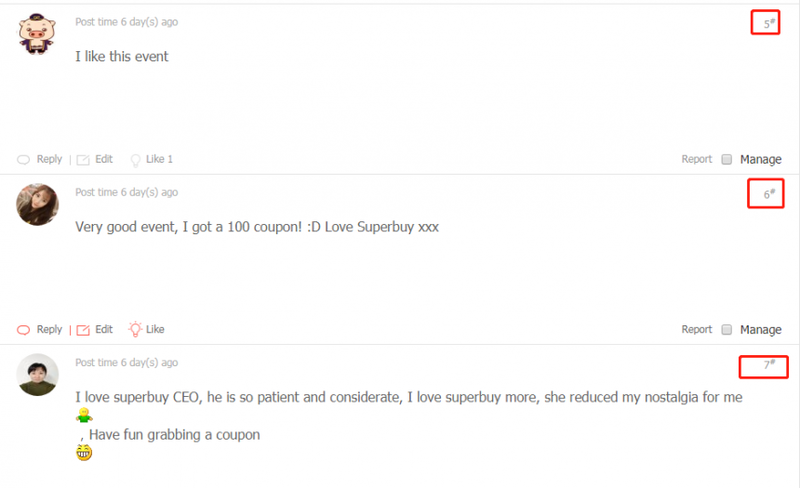 A:You can view the claimed coupons in “My Superbuy – Wallet – Coupons”. A:You can view the claimed coupons in PC“My Superbuy – Wallet – Coupons” / APP ”Me– Coupons”. Superbuy will ban the user from the event automatically. that violates the rules and ban the userfrom joining Superbuy’s future events. Also, Superbuy reserves the right topursue legal actions. and we will answer the questions for you! * This event is not related to Apple Inc.
* Superbuy reserves the right of final interpretation. mattcord replied at 2018-12-10 22:56 good event! You are Comment #100, congratulations on getting 100 Credits! ! Since your previous users posted violations, your comment #150, congratulations on getting 150 Credits! ! your comment #200, congratulations on getting 200 Credits! ! your comment #250, congratulations on getting 250 Credits! ! Since your previous users posted violations, your comment #50, congratulations on getting 50 Credits! ! Event Rules clearly states that Participant cannot leave more than 10 comments between two eligible comments.Your previous two contestants have violated this rule，so congratulations on your 300 Credits reward. Points have been issued, thank you for your participation, more exciting activities, so stay tuned. 本当にありがとう。100元のクーポンはお得です。 Thank you very much!!! You guys are so fast, but I still got the magic ticket. I'm often incompatible with you because I'm not perverted enough. Lucky, got a 20, come back tomorrow. Thanks a lot, I was just get ready to buy something. I didn't got it last night, try next time maybe. I like this event, just buy some garage Kits.